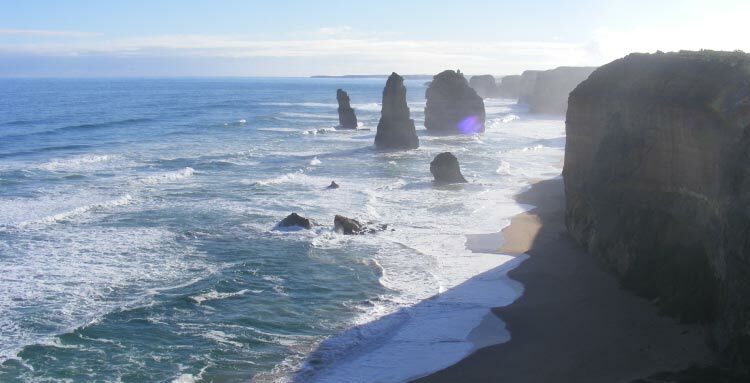 Victoria’s south-west coast is one of Australia’s great Campervan Hire Melbourne scenic destinations, with the Great Ocean Road connecting a number of must-visit locations. 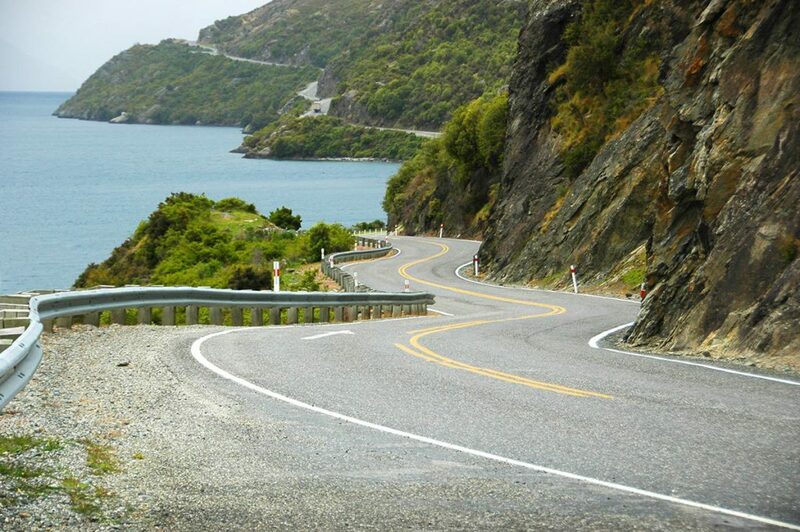 The winding band of bitumen passes wild surf beaches, towering forests, rugged cliffs and limestone formations. Stop at Torquay for its thumping surf, Lorne for its lively resort atmosphere, Apollo Bay for a jaunt into the forests, and Port Campbell for scenery that is way more impressive than any photograph. To the north is the iconic mountain scenery of the Grampians, protecting significant Aboriginal rock art. From Melbourne, follow highway signs to Geelong, about 100kms from the CBD in your motorhome hire vehicle. In about 1hr and 20 minutes you’ll be in Torquay and the beginning of your Great Ocean Road campervan rental adventure! Torquay itself is nothing remarkable, but it’s the thumping waves offshore that make it south-west Victoria’s surfing mecca. Winds push the swells up along th ecoast, aided by low-pressure systems from the Southern Ocean, while the reefs, headlands and beaches help shape the waves into reef breaks and beach breaks. The best surf is between April and September, when the winds are icy and the water hovering at a chilly 13 degrees celcius! The signature break around Torquay is Bells Beach, around 5km to the town’s south-west. It has a rock-shelf coming right to the shore, and a steady incline means waves break consistently, whatever the size of the swell. On a good day, distinct swell lines can be seen forming hollow, 3-4m waves. Bells hosts the Rip Curl Pro during Easter, where you’ll see a plethora of campervan hire vehicles parked in and around the town. Another classic surf beach is Winkipop, while beaches like Jan Juc are good for beginners. If you want to learn how to surf, a few schools operate in the area. To deck yourself out with gear, or just soak up surfing culture, head to Surf City Plaza in the centre of town. Torquay is the birthplace of the major brands Rip Curl and Quiksilver, which still have large outlets here, as do many other brand names. You’ll also find the Surfworld Museum, holding memorabilia from the early 1900’s through to today, a surfer fall of fame and a theatre screening surf flicks. There are a number of great beachside caravan parks in Torquay and nearby Jan Juc, with powered campervan hire spaces and motorhome hire friendly spaces. Where to Stay in Torquay? 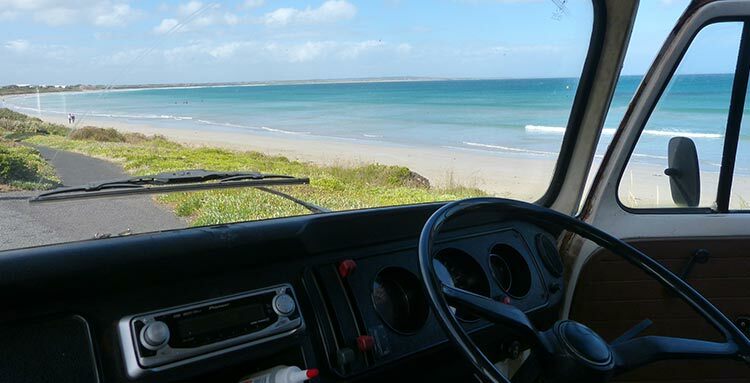 Anglesea is another great little town along your Campervan Hire Melbourne adventure! You might choose to do what most visitors do – that is, speed in your Campervan Hire vehicle past Anglesea and Aireys Inlet en route to Lorne. But if you have more time, you can pleasantly while away a few days in both towns, and hit Anglesea Golf Club, renowned for its resident kangaroos. Surrounding the town is bushland known as the Anglesea Heath. Minor vehicle tracks double as walking trails, passing spring orchids (details and maps are available from Parks Victoria). Other Anglesea walks include the boardwalks through the wetlands of Coogoorah Reserve on the Anglesea River (behind the boatsheds on the river); the beach towards Torquay; or the extended Surf Coast Walk that runs between Jan Juc and Moggs Creek. Aireys Inlet is marked by the red-capped Split Point Lighthouse, also signalling the beginning of Fairhaven Beach. At 6kms long, this is one of the longest beaches on the Great Ocean Road. The road above it runs for its entire length, making it easy to access the beach at all sections (however, only an area near the lifesaving club is patrolled in summer). There’s also the option for horseriding along the beach and into the bush. Where to Stay in Anglesea? One of the Great Ocean Road’s most famous stopovers, Lorne is a must-see town in your Melbourne Campervan Hire vehicle. At the height of summer, the beach at Lorne can seem just as crowded and fashion-conscious as Sydney’s Bondi Beach. But Lorne’s beach is wide and long, so you should be able to find your own patch of sand. A smattering of historic hotels gives the town an English air, and there are great eating and accommodation options, all the mod-cons and plenty of young people here to have fun. The Falls Festival, held every New Year’s Eve, is a major draw-card for young, music-loving campers. For a nature experience, Erskine Falls is around 10km from Lorne, with water plummeting 30m into a ferny gully. You can get there either by campervan or, if you’re in the mood for a hike, walk along the river from Lorne central. In Lorne there are plenty of restaurants, pubs and clubs to keep you entertained at night. There’s also plenty of accommodation options available including caravan parks, backpackers and hotels. 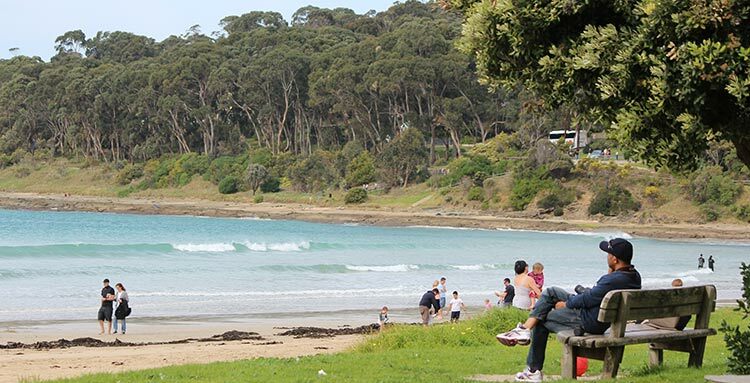 You won’t find too many free places to camp out in your campervan or motorhome around Lorne, and take caution when choosing an area as the local council have been known to fine illegal campers. Where to Stay in Lorne? Apollo Bay is less adulterated by the tourist trade than Lorne, although accommodation (P.S hire a campervan in Melbourne instead!) is often booked solid in summer, and the town and beach can be crowded. But underneath it all, you can still see the town for the rugged fishing outpost it is. Stroll down to the wharf to see local fleet and their bright stack of craypots and floats. The Apollo Bay Fisherman’s Co-op sells whatever happens to be hauled in each day. South and west of town is the bulk of Great Otway National Park. The main attraction is Otway Fly, a steel-trussed walkway through the trees, 25m above the ground. Tickets are expensive, but if your budget doesn’t extend so far, there are other places where you can get close to the trees, if not in the actual treetops. 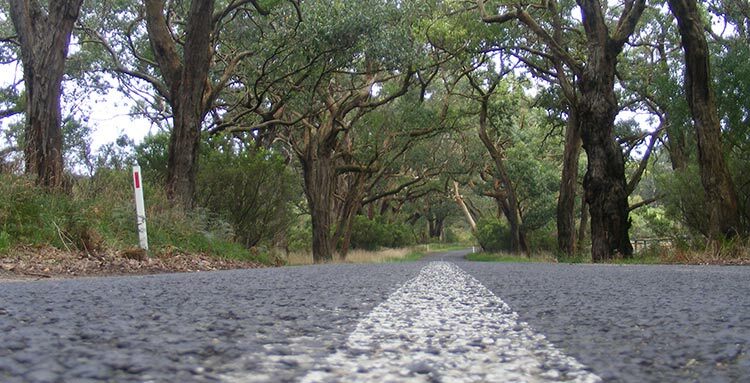 Around 15 minutes west of Apollo Bay on the road to Lavers Hill, Maits Rest has a 20-minute walk through the ferns and moss-covered trees. More of this scenery can also be found beyond Lavers Hill at Melba Gully, but you should definitely plan to visit the gully at night – the forest floor is lit up with twinkling glow worms! Other park highlights include Cape Otway Lighthouse, the oldest in mainland Australia, and Lake Elizabeth near the town of Forrest. This tranquil lake was created by a landslide in 1952 and is home to platypus. Otway Eco Tours run guided canoe trips to see the platypus, claiming a 95% strike rate!. The Great Ocean Walk runs through Great Otway National Park between Apollo Bay and Glanample Homestead near Port Campbell. The track covers 91km in total, taking anywhere from five to eight days. Walkers ramble over deserted beaches and cliffs, and through coastal heath and rainforest. There are walker-dedicated campsites en route, or you can choose to do just a short section of the walk. Where to Stay in Apollo Bay? The Great Ocean Road’s star attraction is the Twelve Apostles – a must-see highlight along your Campervan Hire Melbourne roadtrip. While gradually dwindling in number (the most recent apostle to topple did so in 2005), these craggy peaks marooned just off the coast are still an awesome sight. Surging seas and salt-laden winds blasting in from the Antarctic have shaped these limestone rocks, which are formed from layer upon layer of marine creature skeletons. A large carpark to park your campervan or motorhome leads to a viewing area, or you can climb down Gibson Steps for a view from the beach. For perhaps an even greater sense of the region’s beauty, isolation and history, head to nearby Loch Ard Gorge. The small beach tucked into the cliffs is where the young Tom Pearce and Eva Carmichael swam ashore when their ship, the ‘Loch Ard’, sank in 1878. The wild weather proved treacherous for many sailing ships, giving the regeion its name, the ‘Shipwreck Coast’. However, on a warm and sunny day this beach can feel like a private paradise (the sea is best left for paddling as it slopes away severely). West of Port Campbell are more impressive formations, such as ‘London Bridge’ and the ‘Bay of Islands’. Port Campbell is the best place to base yourself when exploring this part of the coast as it has multiple accommodation options including caravan parks for your campervan or motorhome. It’s a small fishing and (these days) tourist town with a lovely little beach. The highly informative interpretive centre nearby is also worth visiting for further information on the coastline’s many caves, arches and blowholes. Where to Stay in Port Campbell? After cruising along the Great Ocean Road in your Melbourne Campervan Hire vehicle, Warrnambool can be a welcome site, with plenty of large supermarkets to replenish supplies, fuel stations and camping stores. While this regional city is large and in some ways uninspiring, it definitely has a few drawcards. With a natural setting on a long beach, southern right whales visit Warrnambool yearly during the winter. These huge sea creatures have suffered badly from harpooning over the last few centuries – they were considered the ‘right’ whale to hunt, being slow-moving, floating to the surface when killed, and yielding plenty of blubber. Today, around 1,000 southern right whales visit Australian waters each year. In the past they have arrived at Warrnambool’s Logans Beach around June to give birth to their calves, and linger until September. A large lookout platform has been built into the tall dunes. However, check for the best sighting spots, as recent seismic testing in the area has encouraged many whales to move further up the coast. Warrnambool’s university has bolstered the town’s nightlife, which centres around the southern end of Liebig Street. Bands play at several venues on Friday and Saturday nights. Where to Stay in Warrnambool? The last seaside town along the Great Ocean Road (unless you’re heading onwards to Adelaide!) and the end of your epic Melbourne Campervan Hire adventure! Almost every city-dweller dreams of escaping to somewhere just like Port Fairy – small, quaint, with a sense of history and a great beach. Cafe culture has followed on the heels of burgeoning real estate, and some locals even think the town has grown too big for its boots. But Port Fairy is still a charming place to spend a few days, strolling along the beach and historic wharf, and enjoying the cafes and restaurants. A good short walk is out to the lighthouse on Griffiths Island. If you’re here between late September and April, then watch for flocks of short-tailed shearwaters, which return to their burrows on the island each night. Where to Stay in Port Fairy?